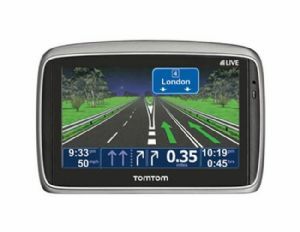 TomTom GO 950 LIVE combine TomTom's leading IQ Routes™ technology, stylish design and powerful route calculation with a completely optimised user interface. Full attention has been paid to the integration of TomTom's routing technologies into the user interface of the device, making it more intuitive and easier to operate. LIVE snapshot gives you all the relevant information in your surrounding area right from the start.You'll be able to see real-time information at a glance, including traffic conditions, safety cameras and fuel prices, making your drive more relaxed. The new TomTom GO 950 Live calculates a route faster than ever before and ensures drivers are ready to go within seconds. It uses the world's largest collection of historical speed profiles. This ever-growing database now includes over 800 billion historic speed measurements of 15 million road kilometres in 24 European countries. Once on the road, the device is constantly checking if there is faster route, taking changing road conditions into account by using a combination of IQ Routes technology and RDS-TMC information (optional with TMC Active dock). Full attention has been paid to the integration of TomTom’s routing technologies into the user interface of the device. This makes it more intuitive and easier to operate; giving drivers all the information they need about their journey before they set off, at a glance. HD Traffic™, safety alerts and fuel prices are all clearly displayed on the screen via the new LIVE snapshot. Once on the road, drivers automatically receive real-time updates on what’s ahead, so they remain informed throughout their journey. On top of this, new menus including a frequent destinations menu have been added to calculate a route to a frequently visited destination easier and faster. Finally, an Eco Routes option has been added to the route options menu, so drivers can select the most fuel-efficient route to help reduce their impact on the environment. In selected European countries, the new TomTom GO 950 has been enriched with third party Points of Interest (POI's) content, including Yellow Pages in Denmark, Merian Scout in Germany and Guia Campsa in Spain. The TomTom GO 950 features more maps than ever before, including Malta, Greece and Turkey for the first time. In addition, all devices offer TomTom's unique Map Share™ technology which allows users to make instant changes to the map and share these with others through TomTom HOME, TomTom's free desktop application. TomTom IQ Routes applies the historical travel time experience of millions of drivers to calculate the fastest route possible. The technology is based on historical speed measurements for every time of day, one for every road segment, from large motorways to small local roads. In up to 35% of all cases, the use of IQ Routes results in driving a faster route, saving significant travel time as well as money and fuel. LIVE Services are only available in the UK. The first 12 month of LIVE subscription is free, after which you can extend this at a monthly cost. Subscriptions can be cancelled with one month's notice from the end of any month. According to recent research, 49% of Britons say that traffic jams are the most frustrating and stressful part of their day*. The TomTom GO 950 LIVE models automatically connect to TomTom’s exclusive High Definition (HD) Traffic service for the most accurate and detailed live traffic information, which is updated every three minutes. If the measured traffic conditions differ from the expected traffic flow, the TomTom GO 950 LIVE will automatically calculate a better, alternative route if one is available. The expected time of arrival will also be adjusted accordingly. The TomTom GO 950 LIVE devices also provide five-day weather reports in the local area, or for the chosen destination, allowing users to plan their journey according to road conditions. TomTom’s HD Traffic service is based on the anonymous measurements of ordinary mobile phones moving through the network. A significant proportion of mobile phones on the move are in cars. Analysis of these results gives accurate traffic information for all major and secondary roads. The HD Traffic service is further enhanced with information from TomTom users who wish to share their travel time information anonymously with other users. This contributes to the accuracy and granularity of this unique service. It gives a much more accurate traffic information resource than traditional systems and for much larger territories. Gives you easy docking and charging to optimise your TomTom GO for daily use. For in-car charging of your TomTom device. Register and you’ll receive € 10 (or the equivalent amount in your local currency) to spend on maps or accessories on www.tomtom.com!